1.The air compressor is not included and this product should be used with the air compressor. 2.The mask in the picture is not included, it just shows how to use this product. 1.The air compressor is not included and this set should be used with the air compressor. 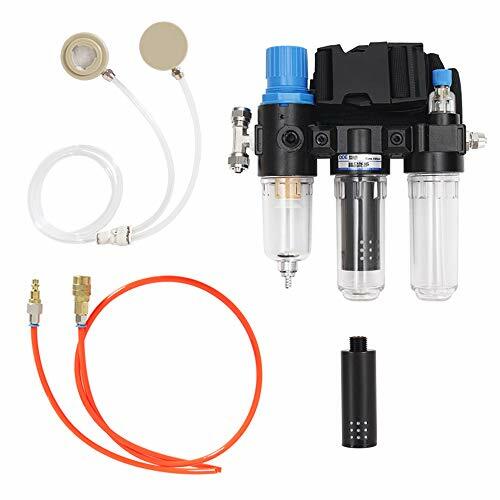 PLENTY OF AIR IN THE MASK(The mask is not included, please prepare it by yourself)-------Compared to self-suction filter-type mask, the greatest advantage of GM14 supplied air mask is plenty of air in the mask. By using it, you don't have to breathe hard when you work. CE CERTIFICATION-----This supplied air unit goes through a series of lab testing (CE) to ensure quality and safety for you. If you have any questions about this product by Chudeng, contact us by completing and submitting the form below. If you are looking for a specif part number, please include it with your message.